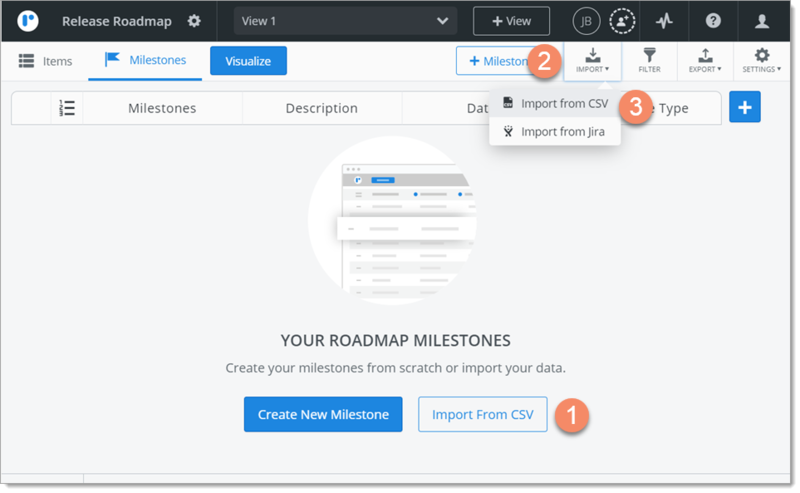 Roadmunk's Import step-through dialog makes importing milestones from a CSV as easy as 1, 2, 3: Upload, map, import. There's some simple formatting the CSV file needs to follow for the import to work. 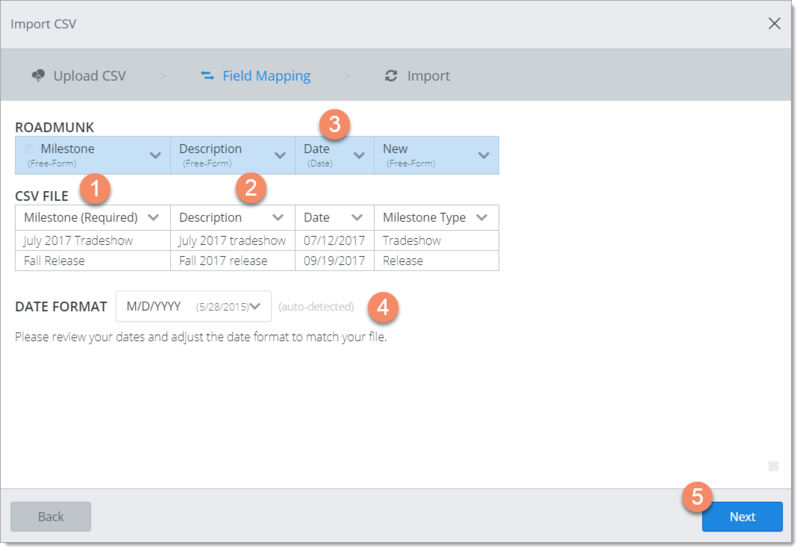 Start the import of the CSV file in the Milestones Table. 1. Click the Import from CSV button (appears only if the roadmap has no milestones). The Import CSV dialog walks you through the import, starting with uploading the CSV file. The next step is mapping CSV File milestone field to Roadmunk milestone fields. 1. 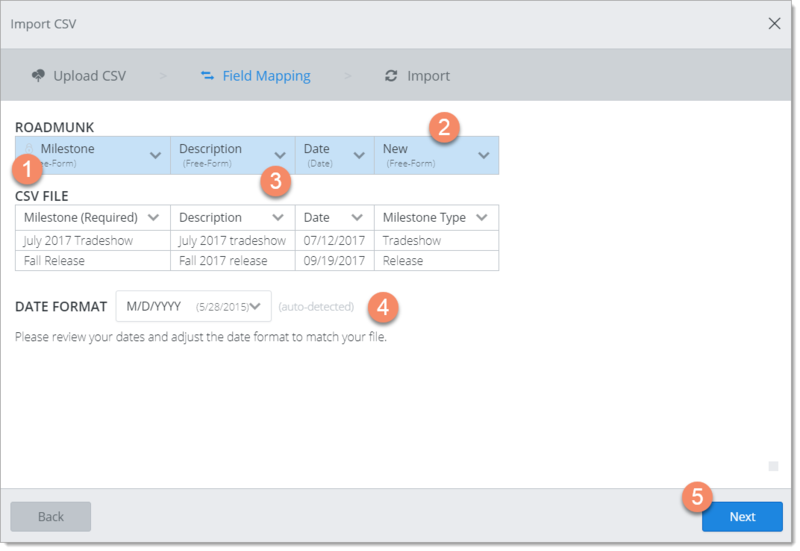 In the Field Mapping tab, you should see the CSV File Milestone field mapped to the Roadmunk Milestone field. 2. You should also see any custom fields in the CSV File fields mapped to the corresponding Roadmunk fields. If a corresponding field doesn't exist, Roadmunk creates a New one. TIP: If you decide you don't want to import one of the custom CSV File fields, click Remove in the corresponding Roadmunk field's dropdown. 3. The CSV File Date field is mapped to the Roadmunk Date field. 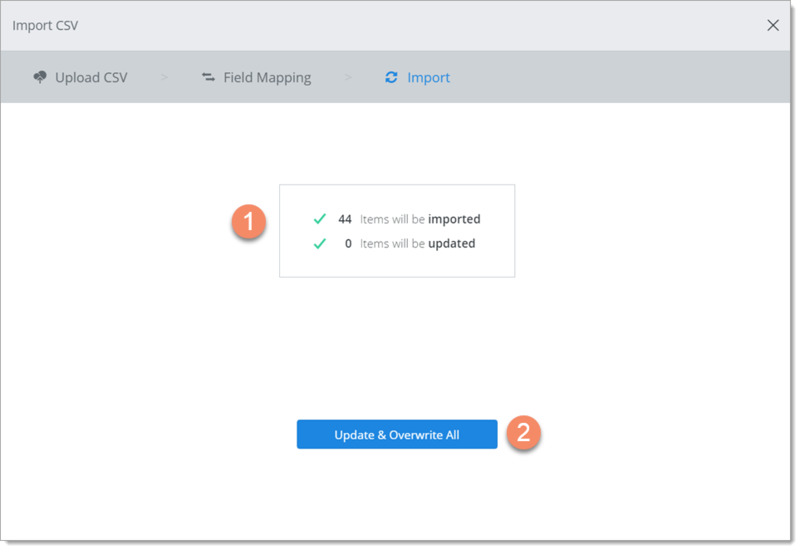 For detailed help on mapping fields, see Field types and field mapping and More about field mapping below. 1. The Import tab shows a quick summary of how the milestones will be imported. 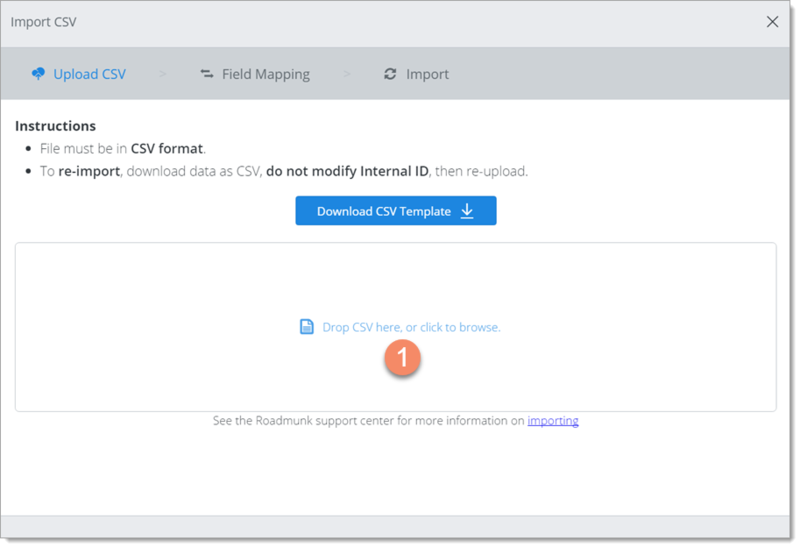 Field types in the CSV file must be one of the types currently supported by Roadmunk as described here. 1. For a successful import, CSV File fields must be mapped correctly to Roadmunk fields. If a matching field doesn't exist, Roadmunk creates a New field with a matching type. The new field is added to Roadmunk during the import using the name in the CSV File field's header. 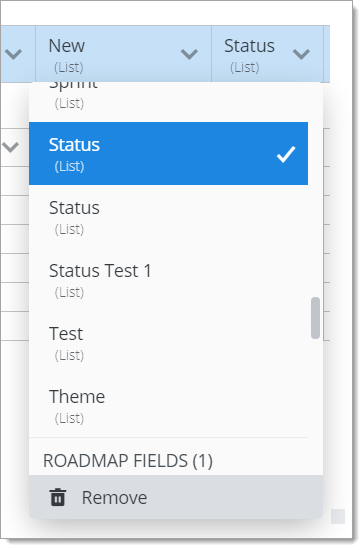 For example, if a new field is created to match a Status field in the CSV file, the field will be named "Status" in Roadmunk. 3. If a match doesn't look right, you can select a different field in the Roadmunk field's dropdown, as long as it's the same type. 4. To change the order of the CSV File fields, change the field headers as needed, then select the correct matching Roadmunk fields. Importing milestones to a roadmap is the same as adding roadmap milestones. You must be the roadmap's Owner OR the roadmap must be shared with you as an Editor. If a roadmap has been shared with you as Viewer, you have view-only access to the roadmap and can't import milestones to it. You'll see a View Only icon on the Roadmap navbar, and the Import icon on the View navbar will be grayed-out and disabled.